Here in Vermont we were very lucky this time around when Hurricane Sandy struck — we were spared the devastation that took all of us by surprise a year ago in August. It is sad to see the destruction that has befallen our home state of New Jersey, especially “down the shore”. It was however interesting to see as I drove around over this past weekend and on Monday before the storm gained a foothold, the preparations being taken here, although the forecast was not as dire as it was in the New York area and other coastal sections of the eastern seaboard. The gas stations were doing a booming business since everyone was there, filling their vehicles, filling their supply of gas cans (a requirement here in Vermont), and even some folks had their generators on their vehicles, filling those as well. The stores didn’t have the run that the stores closer to the storm did, but clearly you could see that people had some extra water or milk in their shopping carts. As I dropped a child off down in town, I was amazed to see that every single house along the way had their outdoor belongings tucked away or tied down, bare lawns and secured belongings clearly added to the evidence that the folks in Vermont weren’t taking any chances this time around. One of the good things about living up here is that you feel almost compelled to be “stocked up”. Everyone, or so it seems, puts food by for the winter…or the blizzard….or the hurricane… or even the zombie apocalypse (Happy Halloween, everyone!) if you believe my sons. 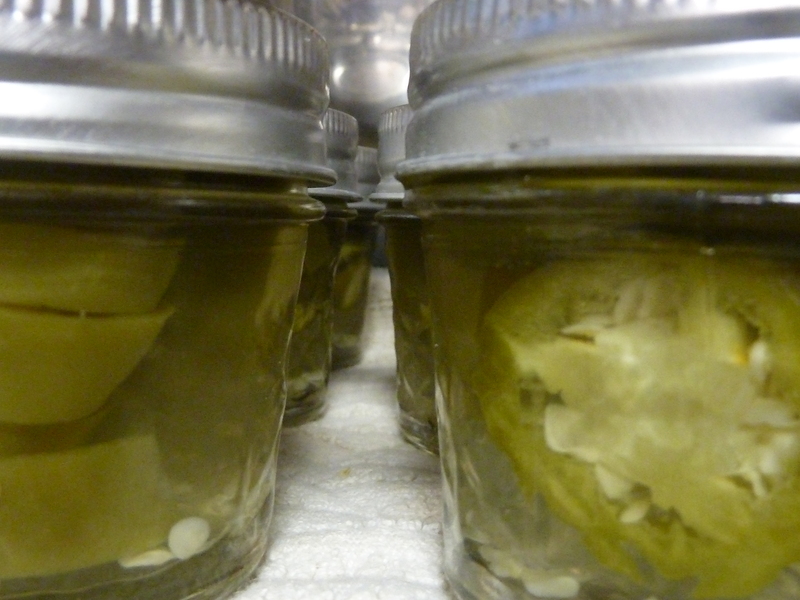 If you don’t can, pickle, dry or jar you are pretty much a newbie and you feel like a loser. If you haven’t learned how to make at least some of the stuff that you eat yourself … well, you definitely aren’t from around these parts. Everyone that I know does some form of preservation of the fresh summer veggies and has other goodies tucked away to keep them going through the bad weather. My recent posts on homemade yogurt and homemade granola go hand in hand with my post on homemade jam. The peppers from the garden have been sliced and frozen for winter soups or stir fries. The tomatoes have been slowly boiled down to sauce and tucked away in the freezer. Habanero peppers, cayenne peppers and Thai peppers have been dried, as has the basil that now resides in a mason jar on a shelf in the pantry. I have made pickles and put up Jersey peaches at the height of the season. Potatoes from the garden will be stored in the basement, along with the canned goods and non-perishables that will help us weather what Mother Nature and zombies may throw our way in the coming months. My sourdough starter is in mason jars (note the plural) in the fridge and can easily be turned into a loaf of bread when the mood strikes. We have huge stockpots that were hauled out a few days ago to hold water in the event that the power went out, so we wouldn’t need to start the generator right away. The firewood was brought in and stacked by the wood stove. Many a batch of dough has risen by the warmth of that fire as have many bagels, cinnamon buns and dinner rolls. When the power was out before the generator, we even cooked soup and boiled water for pasta on the wood stove. 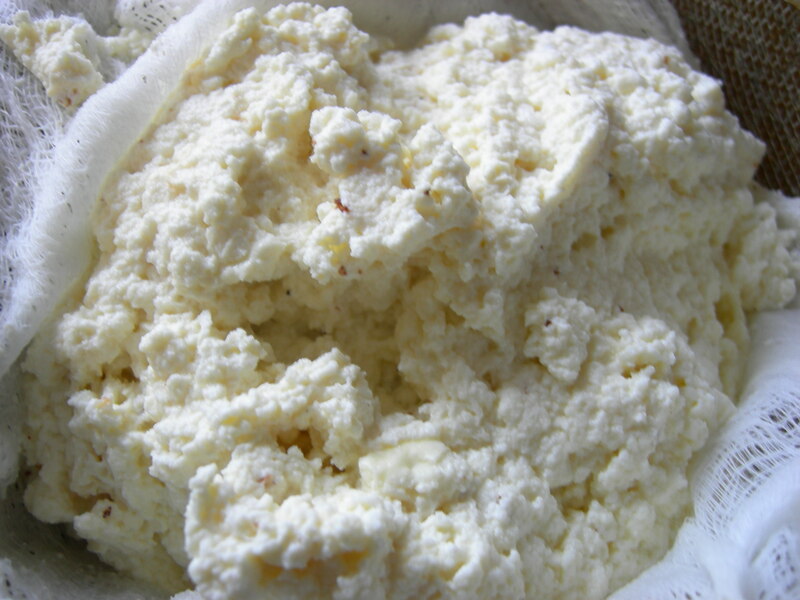 We are fortunate that the farm down the hill is a dairy farm and we have gotten raw milk there on occasion – especially when the ladies and I made cheese. I remember someone that I knew in New Jersey years ago commenting, “why store stuff in our house when we have the supermarket down the street, storing everything for us?” Why? Because you never know when zombies can come out of the wood work or the “storm of the century” decides that you are in its path. Here, we lose the power quite a bit (not as much as we used to, but it happens with some frequency, especially during windy or rainy weather). Sometimes, it happens when you least expect it. For instance, two weeks ago at about 10 p.m. the power went out for about 1/2 hour for no discernable reason. I was critical of Tom’s decision to buy a generator, figuring candles are romantic aren’t they? However, not being able to shower or flush the toilets or have drinking water, isn’t. When we lived in New Jersey a power outage if it occurred usually happened at the height of a heatwave and resulted in no power. We had a gas stove and our water came from the water system. Here, our water comes from a well that guess what? Doesn’t work without power so when our power goes out, so goes our water, and our showers and our toilets. Trust me, generators are a good thing and for the time or two that you might need them for days or a week or more, you will be thanking your stars that you invested in one. If living in Vermont, and my wonderful neighbors and friends, have taught me anything, it is that we have to be prepared to be self-sufficient — whatever the reason. We could survive here for days (in fact, last year when Irene struck we did) without a store run and weeks if necessary. 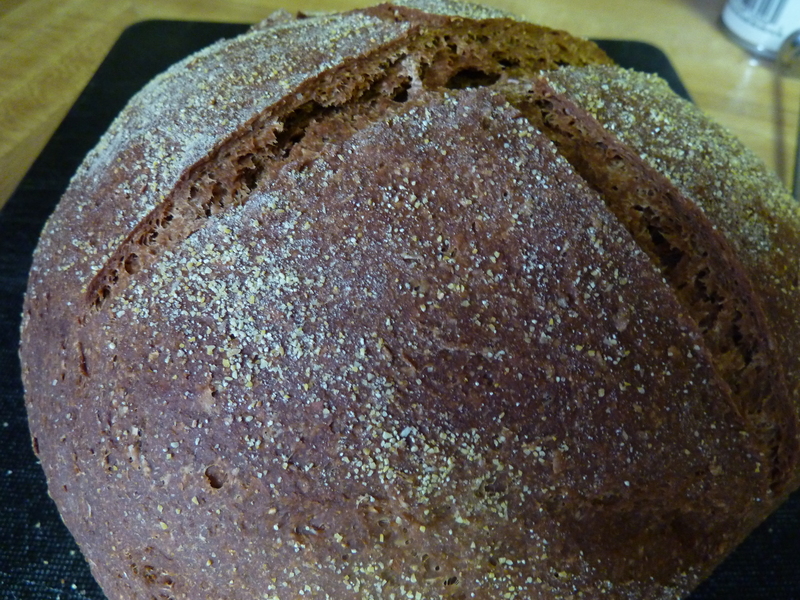 I have made bread on the gas grill, I have cooked dinner on the wood stove. We have melted snow in pots on the wood stove to flush toilets. It may sound apocalyptic but it’s not. It’s being prepared. We are fortunate to have honey from the bees and fresh eggs from the chickens. If the zombies ever did strike, I am sure that we could have chicken from the chickens as well, but I’m hoping that we don’t have to go that route. The goats, cuties that they are, are off limits. Being prepared is something that I have learned not to take for granted. You never know when the weather or the zombies may take a turn for the worse and after these last few storms we have all learned that you can never, ever be too prepared. In addition, knowing that you can take care of yourself and be self reliant and self sufficient, even if it is only for a few days, is a really good feeling. Today marks 10 days until Christmas Eve. Oh, the pressure. This week involves a lot of baking — I volunteered to bake for the vocal concert tonight and a crumb cake is in the oven as I type this with two cookies exchanges coming up this weekend. 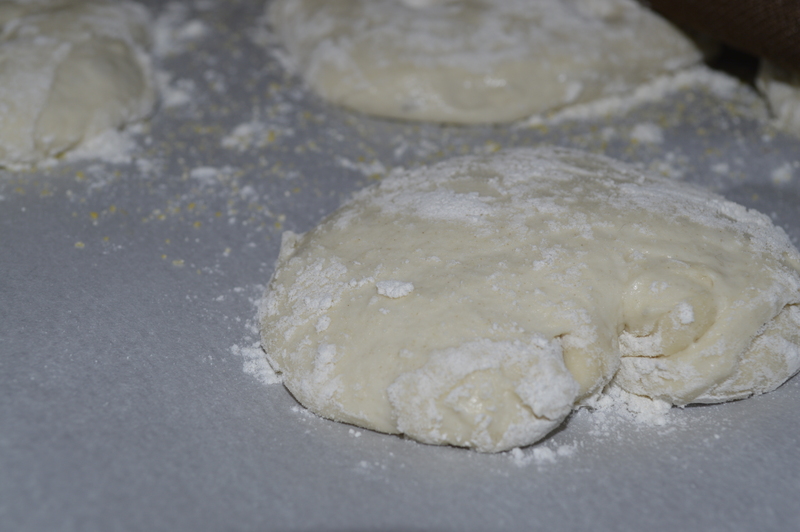 I haven’t yet decided what cookies I will bake for either of the cookie exchanges. I’m guessing that it will be dictated by the time that I have to allot to the tasks when the time comes. I tend to default to chocolate chip cookies when I am pressed for time or too insecure to try something new and different. Besides, it’s the one cookie that I know that my family will eat if it makes a return trip. While there are a lot of very delicious looking cookies out there, a lot of them involve nuts which eliminates at least one member of the family from enjoying them….which is my opinion is kind of mean, especially during Christmas. Speaking of the concert, I’m anxiously looking forward to hearing Tim sing his solo this evening. It should indeed be fun. I love to bake. It’s sweet – usually quite literally. I love the holidays. It is however hard to believe that my inbox has been accumulating “cookie of the day” recipes since before Halloween. I really dislike this push to get us through the holidays — at this rate I’m sure that we will be finding Valentine’s Day hearts and candy crowding the shelves well before we’re ringing in the new year. Don’t get me wrong, I love the holidays, it has always been a big part of my life and my family’s lives. But, really, can we just slow it down and actually enjoy them? My sister commented that it was difficult for my youngest nephew who is autistic to understand why Christmas trees were crowding the aisles of the stores already when they were still shopping for his Halloween costume. It’s difficult for me to understand as well. Thanksgiving is coming up, yet we are bombarded by Christmas all over the place. I realize that the stores are anxiously looking to increase sales in an economy that is less than desirable for any of us, but can we also enjoy the holidays without having to cut ourselves off completely from civilization. I know that there are those folks out there that bake or prebake or make and freeze their cookies well in advance of the holidays. To me, that’s a couple weeks, not a couple months. I can’t even think of holiday cookie baking before Thanksgiving rolls around and I’d like to think that I am not the weird one in this equation. Try to relax, divest yourself of the commercialism and enjoy the holidays, one at a time instead of all at once, pretty soon we’ll just be celebrating Hallothankschristmasyear Day because it would be more time-saving — and then they can start putting out those Easter bunnies in December. Snow day. We spent the day home, not that the weather was all that bad, but hey isn’t hanging around what a snow day is all about? Dinner was going to be simple, burger, potatoes and salad. One problem, no buns. 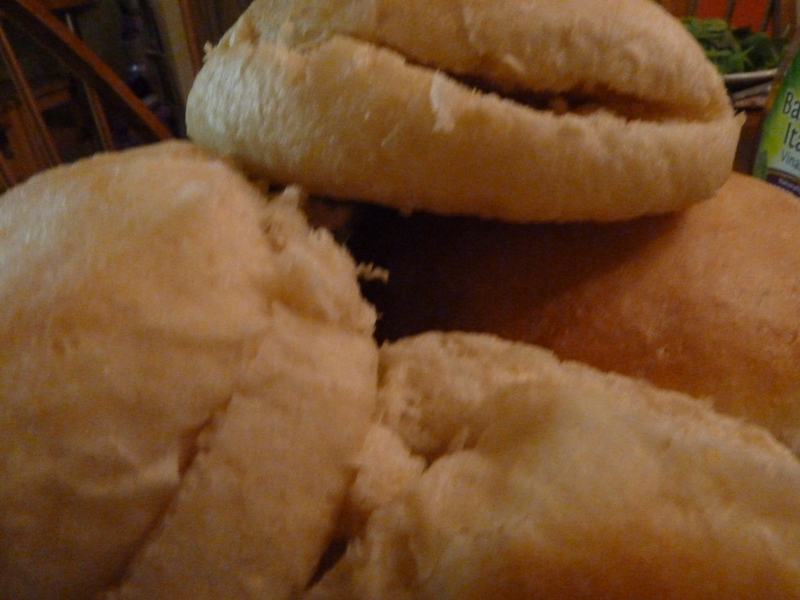 I pulled up this recipe from King Arthur Flour and made these hamburger buns. 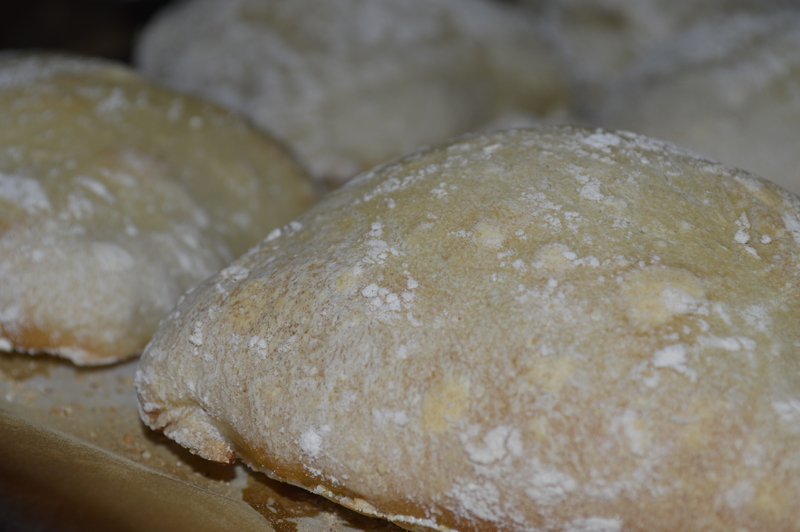 They were easy to make, came out looking delicious and tasted even better. Next time, I’m going to substitute honey for the sugar in the recipe. I didn’t want to try it first time out of the box, since I wouldn’t know whether I goofed the recipe or the substitution didn’t work correctly. 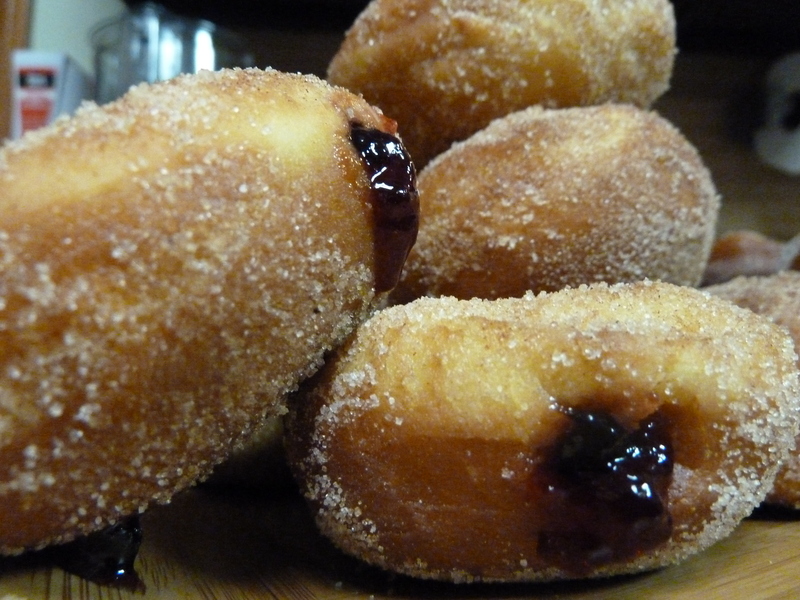 Here’s the link to the recipe at King Arthur’s site. Every year, I definitely think it; most years I also say it — at the very least to myself. Usually however I don’t get to do it. Enjoy the holidays coming up, keep it simple. 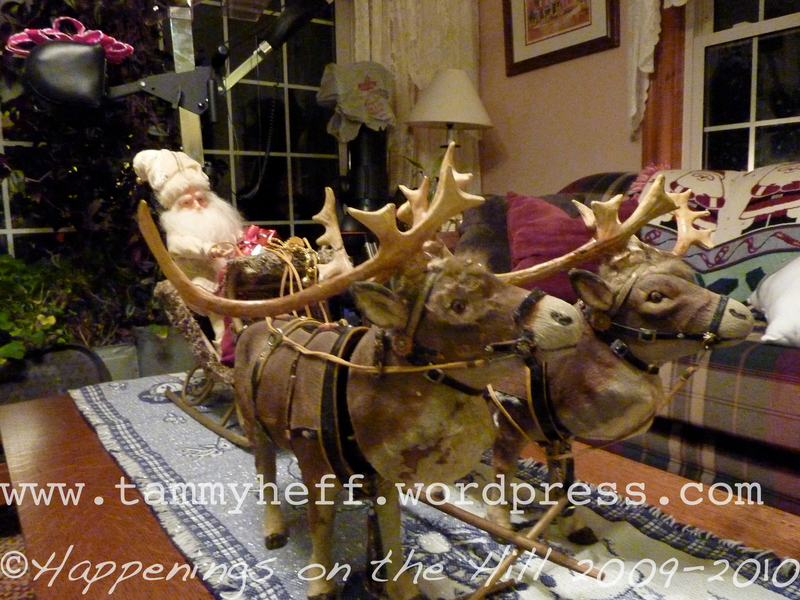 I usually get caught up in the frenzy of the season and make myself crazy in the process. This year, so much of the last few months has been hectic and crazy and complicated — that I cherish the idea of keeping the holidays simple and enjoying them. It’s usually no joke that I’m sick for Christmas, I usually have a horrible cold or at the very least an annoying one. This is directly and most likely related to the schedule of insanity that precedes the day. I am hoping that by avoiding the insanity, I will also avoid the repercussions of it in the form of some type of illness which makes me miserable but still required to perform all of my wife, mother, daughter, hostess Christmas responsibilities. As for gifts, it’s very simple. The boys aren’t asking for much or hardly anything, so less stress on what to get them for Christmas. If they don’t seem to want it, I don’t need to go crazy looking for it. Everyone is therefore happy. Me, especially. I can therefore concentrate on doing some of the things that I would like to do, such as do more baking which also takes the stress off the cookie swaps I am attending (and looking forward to) later in the month and holiday entertaining. The more that I can do now, the less I will have to do later. I am not a good person when stressed, things do not go right. The bad energy extends from my brain through my arms and out my fingertips into whatever I am making/baking or doing. It never comes out well when I stress myself out. I really want to decorate the house nicely. 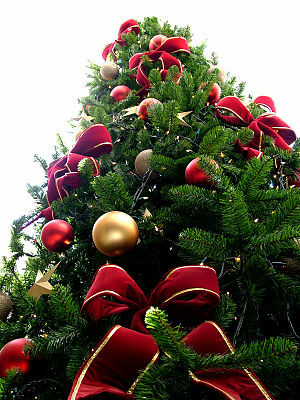 I want to get our tree up, I am anxious to see how it will look in its new location. I am happy to enjoy it for more than a few days before the holidays. I am really looking forward to this since with all the work we’ve been doing Halloween and Thanksgiving weren’t even decorating worthy holidays around here. I am looking forward to spending time with family and friends. To enjoying the holiday, enjoying the peace afforded by this time of year and ….Mother Nature if you’re listening….some of the white stuff for atmosphere would just serve to bolster the holiday spirit. This season I will strive to keep it simple, to enjoy it more and stress less…. and hopefully not be sick for Christmas. I got a covered baker from King Arthur’s Flour from Tom for Christmas. 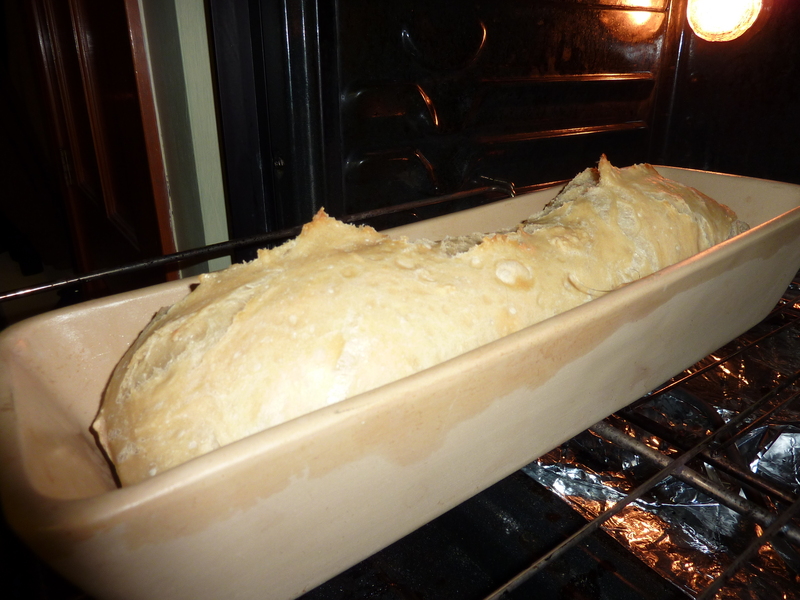 Of course, with a house full of perfectly willing bread-eaters, I had to put it to the test. The test, it turned out, that I miserably failed. 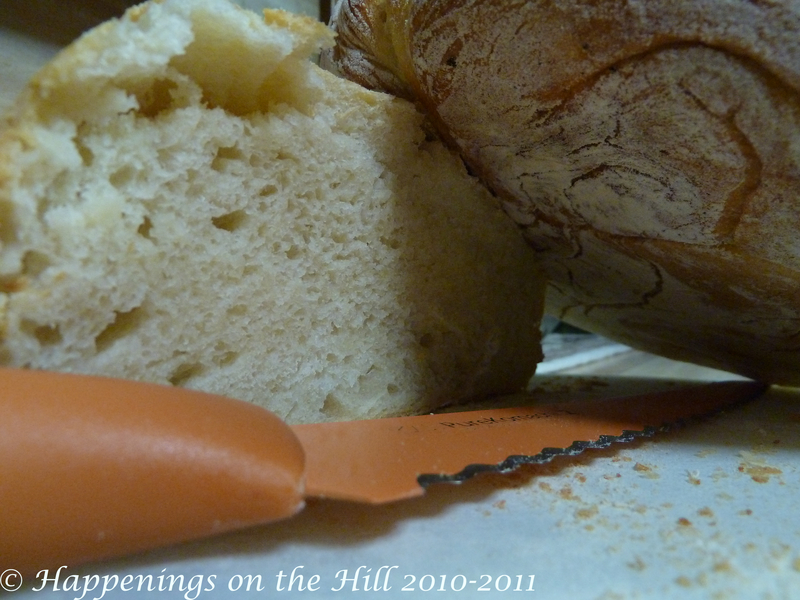 Don’t get me wrong, the bread was delicious tasting, disfigured and ugly as it was after we chiseled it out of the pan. Not once, but twice, I might add. The first time was just plain stupidity. I am used to baking in my cast iron and simply threw the dough in without thinking of the whole “seasoning” thing. The second time, I took the time to follow the directions. Soak the baker in water for 15 minutes to immerse it and so that the pores gather the water to use as steam when it bakes. All seemed perfect, until of course, we attempted to remove it from the pan. 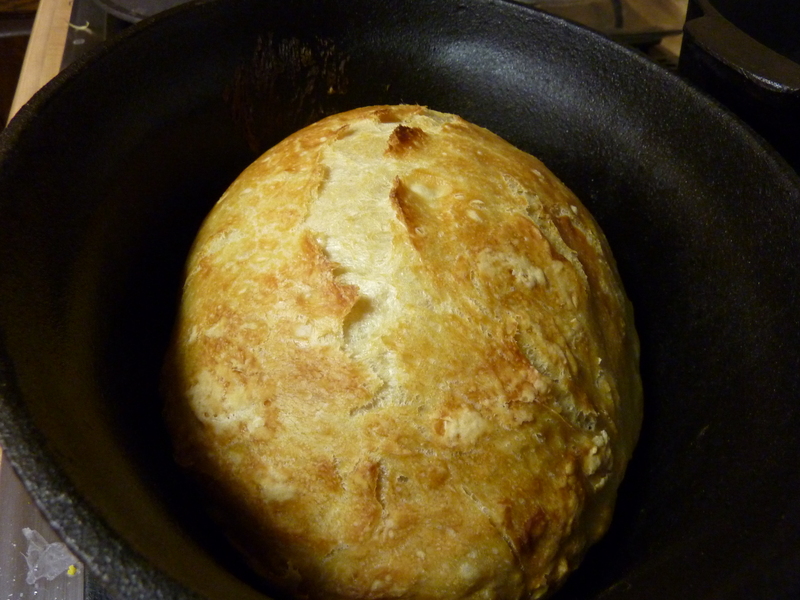 The bread, looked darn beautiful in the pan. We could stare at it and drool just fine. If we wanted to eat it though —well, dig out the chisel again. 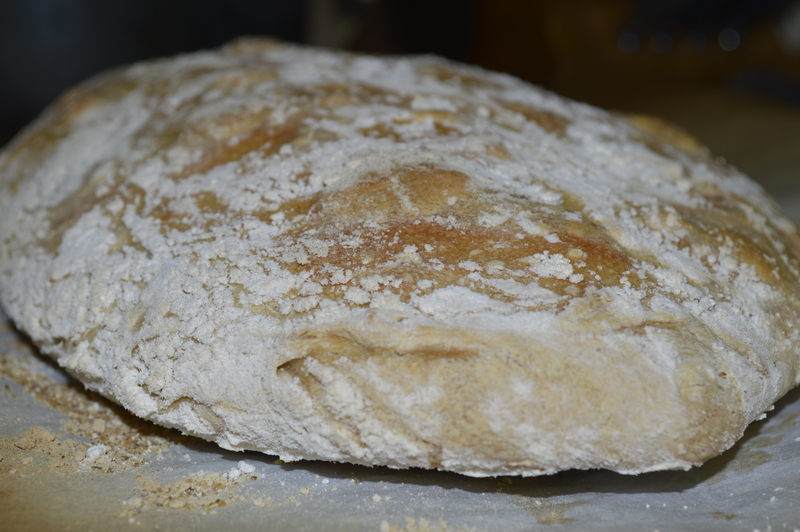 We decided that perhaps I had formulated a new type of bread, single crusted. In fact, we joked that maybe I should tell our New Year’s Eve company that it was planned that way and wait to see if anyway actually asked for the recipe. Beautiful, isn’t it? Yes, that’s exactly the way the other, single crust, chiseled out of the pan loaves looked too. The real test came in the removal process. Tom stood at the ready, chisel in hand. But alas, it was not necessary, the bread flipped from the pan like a fish out of water. Here’s the finished product. Since last Wednesday (mind you this is less than one week), I have baked 12 loaves of bread, and 48 cinnamon rolls plus unmentioned amounts of cookies. 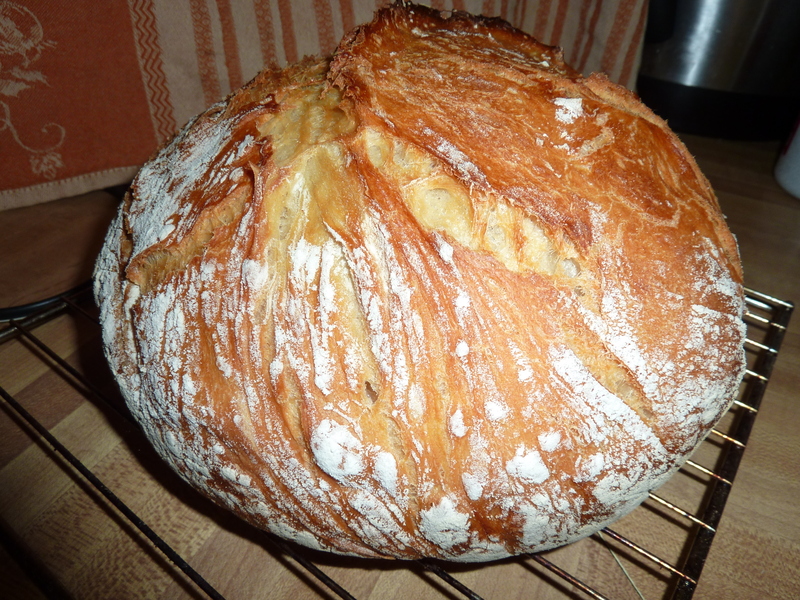 Last night I baked one loaf of bread for dinner and it was gone in a flash. Tonight, I baked two loaves and there is barely any left. I figure that should be up to at least four or five loaves of bread a day by New Year’s the way this crowd is eating and the adults haven’t even shown up yet. 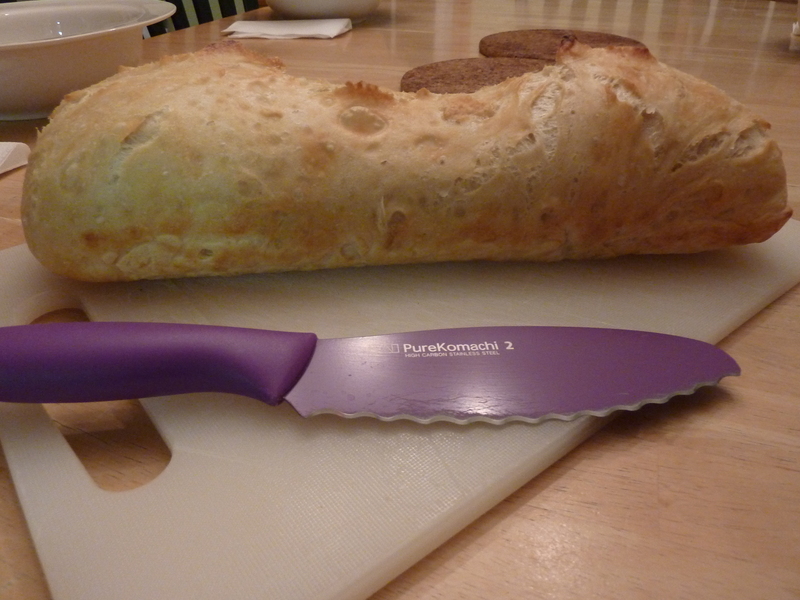 Plus I haven’t even had a chance to christen my new pizza stone or loaf baker. Maybe a bakery is in my future?